Between 1200 and 1300 is formed in Parma the Corporazione dei Beccai (Guild of Butchers), who was in charge of the sale of pork meat. In 1459 the Lardaroli, those who used to slaughter pigs and salt meat, break off by the Corporation. In 1500, however, they encounter numerous laws prohibiting the free movement of pigs in the city; this shows how pig breeding, including both domestic and private, had to be very developed in the area. The entire processing of Prosciutto di Parma PDO takes place in a limited area which includes the territory of the province of Parma, located in the south of the Via Emilia, bordered on the east by the Enza river and to west from Stirone creek. 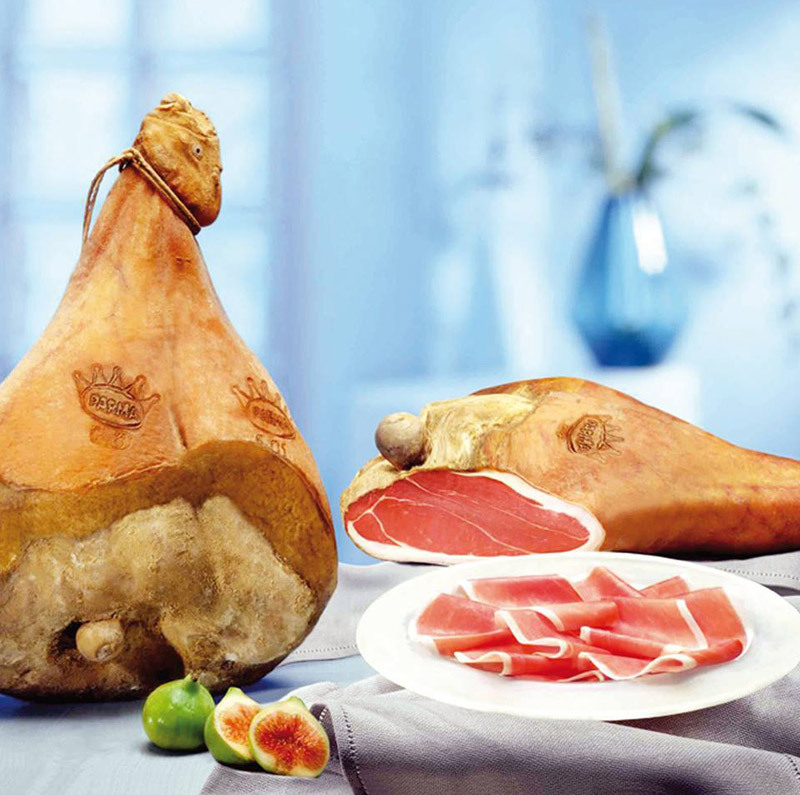 The Prosciutto di Parma PDO is obtained from pigs’ thighs, and the specification provides the steps of trimming, salting, resting, washing – drying, pre-seasoning – grooming, greasing, seasoning, analysis and marking. The salting phase – which includes two rest periods of from one to two weeks – takes place in a diversified way: parts of the rind are covered with wet salt, while the lean parts are sprinkled with dry salt. A period of rest in a special cell with controlled humidity and temperature follows. Then the thigh is washed, trimmed again, and the muscle exposed portion is covered with sugna (a mixture of ground pork fat with a bit of salt and ground pepper, sometimes rice flour). The minimum maturation period is 12 months. Weight between 8 and 10 Kg and not less than 7. Uniform color between pink and red. Delicate and sweet taste, slightly salty. Usually consumed raw without cooking, cut more or less fine according to taste. It can be combined with fresh fruits such as melons and figs. The Prosciutto di Parma PDO was already known by Romans, who brought them to Rome and used for their armies. For the production, in the past, particular salts extracted from salt sources in Salsomaggiore and Salsominore were used; this enabled the ham to develop special seasoning systems that give the product its typical sweetness. Each year in September in Parma takes place the Festival del Prosciutto di Parma (Ham Festival of Parma), with many events, tastings, exhibitions, performances, and visits to production sites. 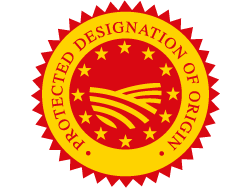 Protected Designation of Origin (PDO) recognized with Reg. EC n. 1107 of 12.06.1996 OJ L 148 of 21.06.1996.